Did you know that Hershey doesn’t use real chocolate in many of their products, like Mr. Goodbar, Krackel, and Kissables? Obviously, you never viewed Hershey’s as healthy, but even many premium and organic brands are up to similar shenanigans; they water down the good stuff and amp up the sugar. It makes financial sense. Both beet and cane sugar are cheap fillers that taste good. Perfect for masking poor quality cocoa. What’s harder to pull off is 100% dark chocolate. It’s not sweet and naturally bitter, so it will be an acquired taste. Most folks will never acquire it. The best balance for diabetics, and frankly everyone, are sugar free chocolate bars without artificial sweeteners like Splenda. You can make them with stevia, monk fruit, and sugar alcohols like maltitol. Each alternate has pros and cons, so there isn’t a one size-fits-all. What follows are reviews of the most healthy bars that use alternate sweeteners… or none at all! Astaxanthin – Derived from microalgae, it demonstrates up to to 6,000 times more free radical scavenging ability than vitamin C in lab tests. 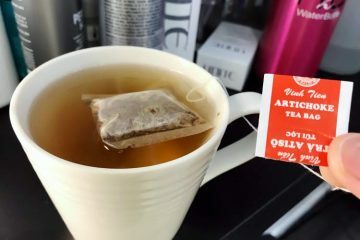 Rooibos tea – A caffeine-free South African herbal tea with numerous health benefits. Coffee cherry – Normally discarded during coffee bean processing, this pulp shell is one of the highest antioxidant fruits in the world. The chocolate is made with maltitol. That’s a sugar alcohol similar to sorbitol, xylitol, and isomart. Found naturally in some fruits and berries, the human body can’t fully digest these carbs, so they have a minimal impact on blood sugar. They’re also lower calorie, since they’re not being fully absorbed. Too much maltitol can have a laxative effect. For some people, it causes gas and bloating. If you’re someone who handles it well, this bar is a guilt-free treat that’s good for you. 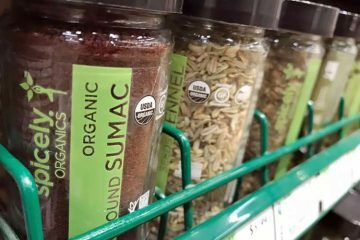 At this time, Sprouts and Vitamin Shoppe are the only two national retailers. 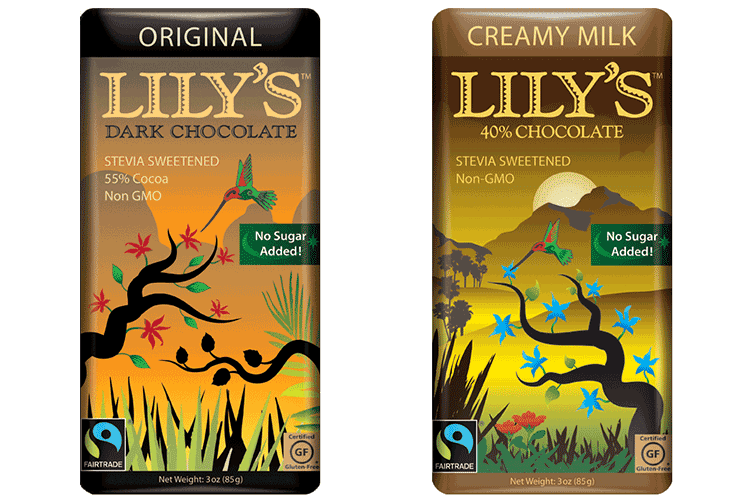 If you want candy sweetened with stevia, the brand Lily’s uses it in all of their chocolate bars; dark, extra dark, milk, salted almond, coconut, crispy rice, salted caramel, and salted almond. Most are 55% cocoa, with the exception of their milk chocolates at 40% and extra dark chocolate at 70%. The stevia taste is offset with a moderate amount of low glycemic erythritol. That’s a sugar alcohol which is generally better tolerated than maltitol in most people. How many calories there are in Lily’s chocolate bars is 340 per 3 oz. serving. That’s for their original dark chocolate. Because it’s sugar free, it’s about 25% fewer calories than a regular 55% cocoa bar of the same size sweetened with sugar. While not organic, their cocoa is fair trade certified and all of their ingredients are non-GMO. All of Lily’s bars and chocolate chips are gluten free. Most are vegan, with the exception of their milk chocolate flavors. Those contain rBST free organic whole milk powder. Whole Foods, Sprouts, and some grocery chains. You can get them on Amazon; here’s the original dark and their 40% milk chocolate. Not sure which to choose? Try their variety pack. Compared to the Lily’s, Coco Polo has limited distribution so it’s a harder brand to find for sale. Both are sweetened with stevia but don’t have the aftertaste, thanks to their use of erythritol. Coco Polo milk chocolate uses a base of 39% cocoa powder. Aside from plain, flavors include quinoa, toasted coconut chia, cherry, hazelnut, and toasted whole almond. They’re not vegan since they’re made with real milk. Coco Polo dark chocolate is 70% cocoa available in plain, toasted whole almond, toasted coconut chia, quinoa, cherry, elderberry, and cacao nib. They’re all vegan. At around 380 calories for most flavors, Coco Polo bars have a slightly higher calorie count than Lily’s, when adjusted for equal servings of 3 oz. 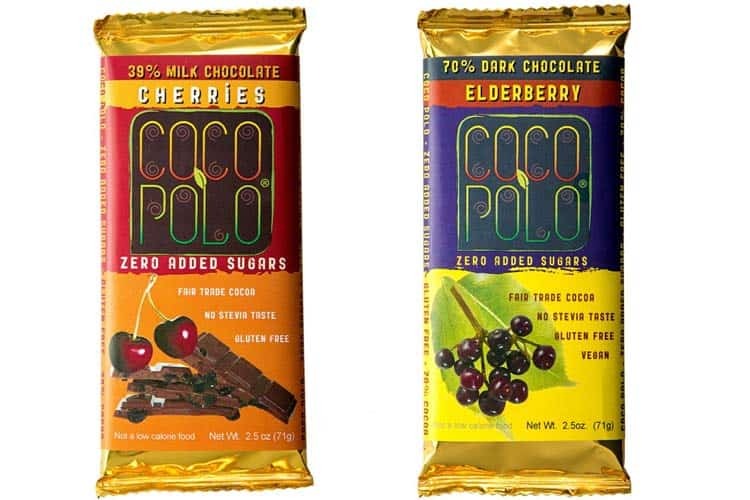 All of Coco Polo bars are sugar free, gluten free, and non-GMO. The cocoa is fair trade but not organic. 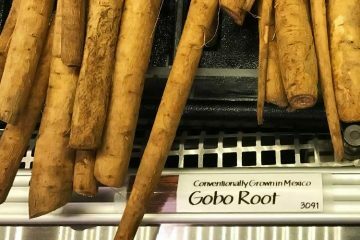 The biggest differentiator in Coco Polo’s bars is added fiber in the form of inulin (chicory root extract). If you eat the whole bar, it has 18g of fiber, which is over 70% of the daily value. This is a potential benefit for weight loss, since fiber can help you feel full. Independent natural grocers. Dark chocolate almond seems to be their most popular flavor and you can get it on Amazon. 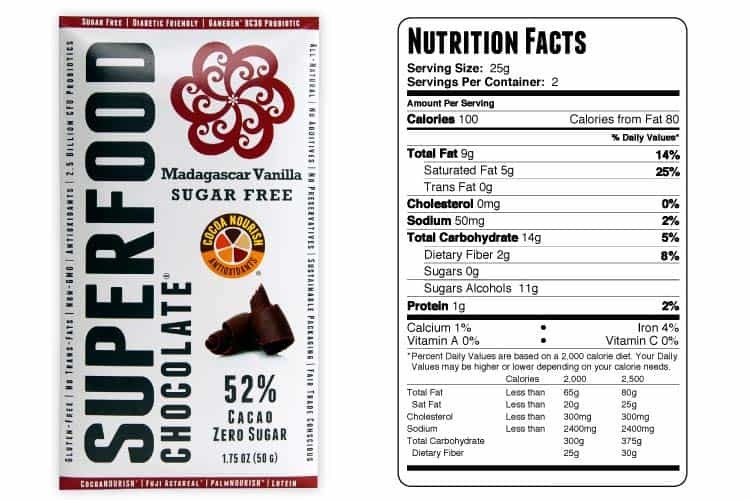 Chocolate sweetened with monk fruit is a healthier alternative to stevia. 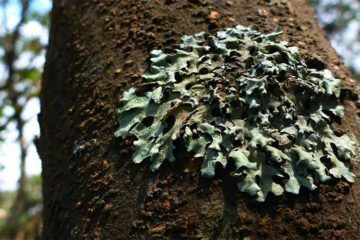 Research confirms that gut flora breakdown steviol glycosides into mutagenic compounds; meaning they mutate DNA. Proponents of stevia may argue that the DNA damage caused by blood sugar spikes is more dangerous than that caused by the stevia byproducts. Probably, but that’s currently unknown. Very limited human data exists. Is stevia safe? Until more is known on it, eating high amounts is probably not preferred. The only drawback with monk fruit is limited availability in the US, but that’s beginning to change. The brand Lakanto monk fruit sweetener has been sold in Japan for decades and their more recent foray into the US, Canada, UK, and Europe is going quite well. 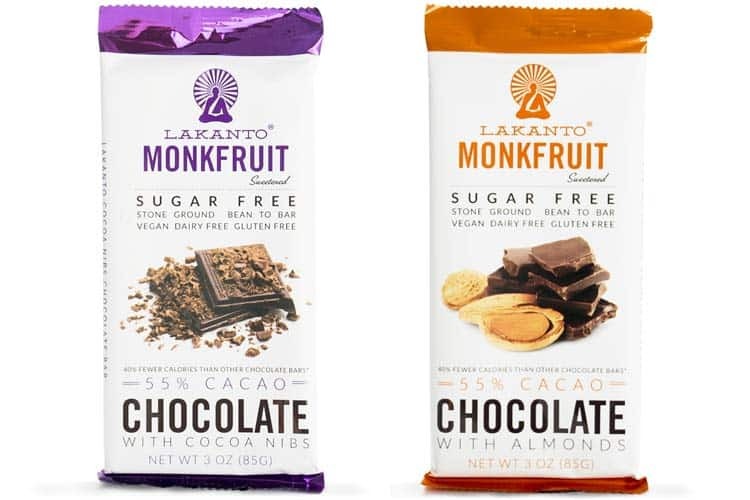 Lakanto sugar-free monk fruit sweetened chocolate is available in 3 flavors; plain, with almonds, and with cocoa nibs. All are moderately dark with a 55% cacao concentration. They are the lowest calorie sugar free bars at only 240 calories per 3 oz. The almond is slightly more at 260 calories. As with Lucy’s and Coco Polo, they augment with erythritol to create a more natural sweetness that’s similar to real sugar. All 3 flavors are vegan and gluten free. They’re good for low carb and ketogenic diets. Unlike other brands, Lakanto assures their chocolate measures as having a zero glycemic index. This makes them the best bar for type 1 and type 2 diabetes. Whole Foods sells their monk fruit extract but we haven’t seen the bars for sale yet. On Amazon you can get all 3 flavors. Many major brands including Ghirardelli, Sunspire, and Dagoba sell bars made with 100% unsweetened cocoa for baking and recipes. Lindt makes one that’s 99%. While there’s nothing stopping you from doing so, these aren’t really marketed to be eaten plain. The best chocolate bars without sugar or sweeteners of any kind need to use the highest quality cacao to taste good. The British chocolatier Montezuma makes a top-rated 100% cocoa bar without any sweeteners, preservatives, flavors, or additives. Obviously, it’s food allergy friendly since there’s no dairy, eggs, soy, gluten, tree nuts, or anything else in the ingredients. Surprisingly, it’s delicious even on its own. It’s rich and decadent, without added sugar. 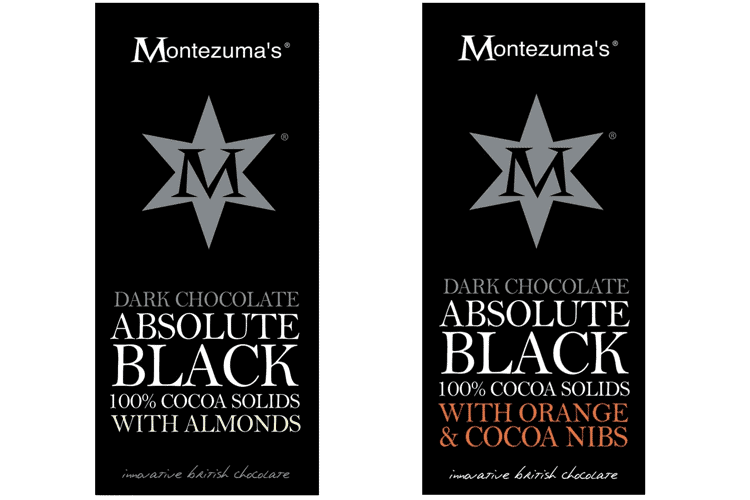 What makes Montezuma’s absolute black taste better than other pure chocolate bars is that it’s made using melted cacao nibs. Not only is this tastier, but it’s also healthier as the base is less refined; this helps preserve phytonutrients. Being a UK brand, it’s sold in 100g bars, which is around 3.5 oz. That’s comparable to a standard candy bar size in the US and Canada. 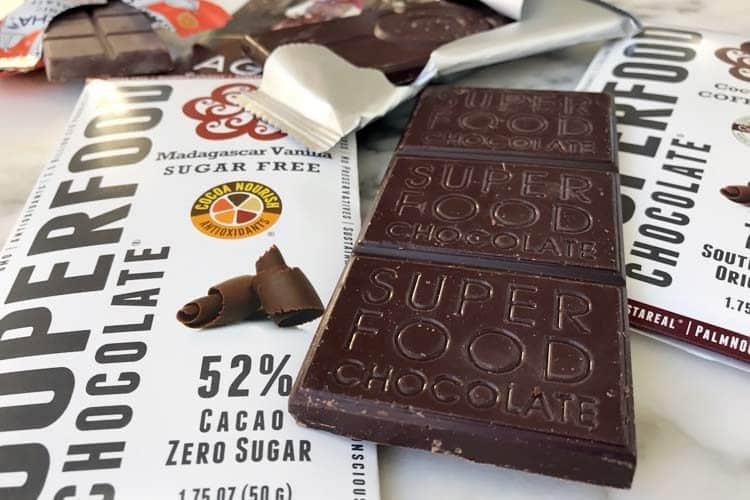 Montezuma is the best sugar free chocolate without artificial sweeteners, sugar alcohols like maltitol, or natural sweeteners like stevia and monk fruit. It’s healthy for you too, since the antioxidants, iron, magnesium, phosphorus, potassium, zinc, manganese, and vitamin K all come from the cocoa bean. Outside London and the United Kingdom, Amazon will be your best bet. If pure unflavored is too intimating, they have one with orange essential oil added. So technically that one is not 100% cacao, but probably 99.99% being that it takes just a few drops of oil to flavor the bar. Here’s the link for the orange but we are willing to bet you can handle the absolute black bar. 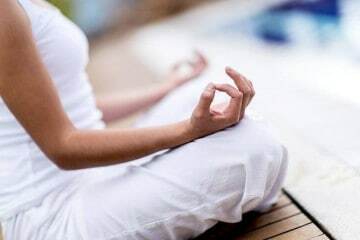 If you go to real sites, you’ll see that not enough is known about stevia to draw firm conclusions, but it may in fact be a tumor inhibitor except at very high doses where there might be some mutagenic effect, but you could probably not tolerate those doses. Also may lower blood pressure. Like the missing explosion in head tumors from cell phones (because there is no cancer effect), stevia is used so much now that either the hospitals should be about to see a tumor catastrophy … or there just isn’t any such effect. The best form of stevia is the original dark liquid made by Planetary Herbals, comes in a dropper bottle and tastes wonderful in teas. I originally started using the original dark liquid when I purchased it from Sunrider Herbals back in 1990. 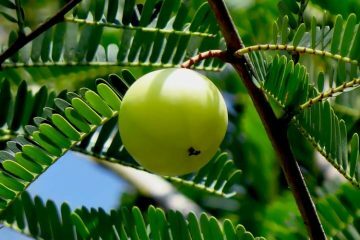 We could only use it as a skincare formula as it wasn’t authorized as a food agent. The white powdery forms of stevia, I would not use. So perhaps the above comment about DNA would be from too much of this white powder.